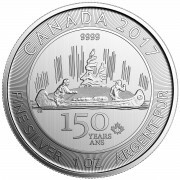 Silver – Depressing and Exciting! 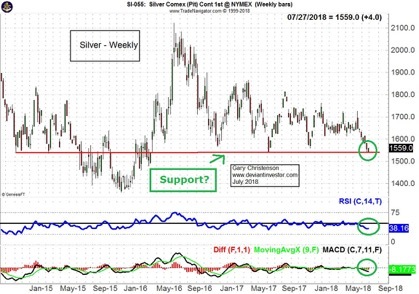 Silver looks oversold and ready to rally. Examine the weekly RSI (a timing indicator) and the MACD (a moving average indicator). These indicators suggest silver prices are low and could rally. Silver closed July 24 at $15.42, which for silver bugs is depressing or exciting: Why? a) Depressing: Silver prices reached that $15.42 level in November 2007, over ten years ago. From that perspective silver has made no upward progress in ten plus years. b) Exciting: In the long term politicians and bankers will create unpayable debts, debauch the currency, lie about their actions and boost most consumer prices, including silver. 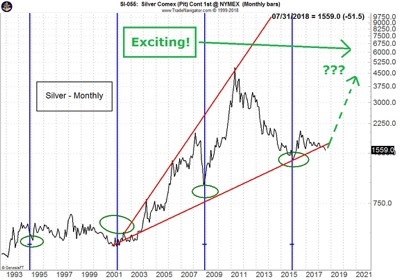 Silver prices have languished for years—they’re due for a rally, perhaps a huge rally. Consistent with the “exciting” analysis is this commentary by Ted Butler, the COT and JPMorgan expert. Also from Bill Holter – link here. Another from Ted Butler is here. M2 (per the St. Louis Fed) is a measure of currency in circulation. It rises exponentially, like other measures of currency in circulation, total debt, pension liabilities, cost-of-living, stock market indices, and commodity prices. Silver prices follow. 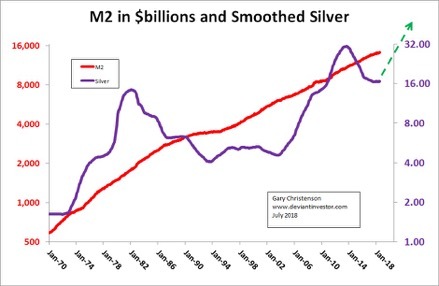 Examine the chart of smoothed silver prices (36 month simple moving average of monthly closes) and M2. The NASDAQ 100 Index and its manic-depressive behavior (approximate prices). 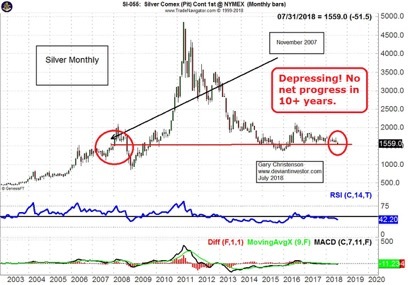 Silver prices and its manic-depressive behavior. Prices for the NASDAQ 100 and silver offset each other. One rises while one falls. 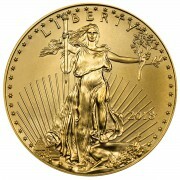 The sum however, rises exponentially, thanks to on-going dollar devaluation process favored by bankers and politicians. 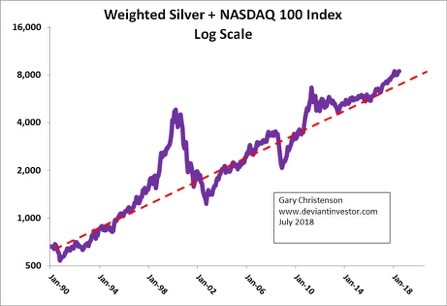 Examine the log-scale chart of their weighted sum (88 times silver + NASDAQ 100). 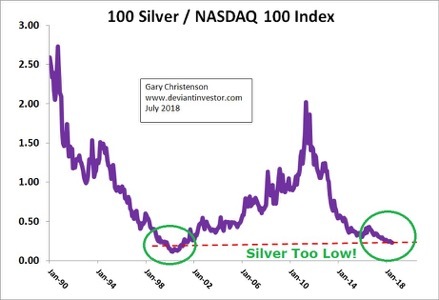 Are silver prices low or high compared to the NASDAQ? Examine the ratio of silver to the NASDAQ 100. Summary: Silver prices are low compared to the NASDAQ 100 in 2018. They have been high in the past and will be again—someday. In the short-term, silver prices are low, over-sold and due for a rally. Exciting! Many investors who bought in the past eight years are “underwater” and irritated. A few kick themselves because they bought silver rather than Netflix or Amazon. Stuff happens. Depressing! Silver prices are erratic, and often bore us to tears before a massive rally. Later they deflate our expectations as prices collapse. Depressing and exciting! It’s not all death and despair. 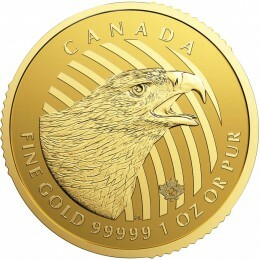 The silver price low occurred in December 2015. Politicians and bankers will continue devaluing all fiat currencies, and silver remains valuable and essential for modern life. Exciting! JPMorgan has amassed a hoard of physical silver bullion – for a compelling reason – greed. Very exciting! Read Ted Butler. 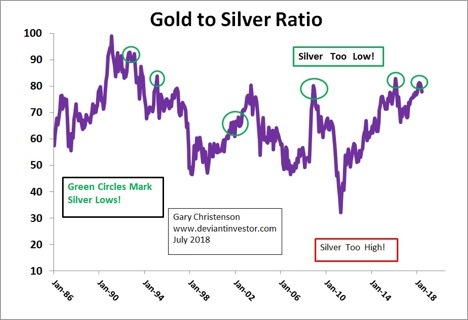 The gold to silver ratio is high—about 80—which has indicated oversold conditions and silver rally zones in the past. Exciting! Silver prices have been so low for so long—under $22—since October 2013, that silver has “worn out” most investors. This market should explode higher – someday. Refer back to the graph of silver and M2, knowing M2 is as certain to increase as the sun will rise and politicians will demand payoffs. Depressing and Exciting! 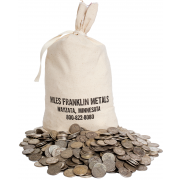 Miles Franklin sells silver and gold. They can’t predict future silver prices, but they believe silver is valuable today and will be far more valuable, measured in devaluing fiat dollars, in several years.